Cozy up to a cup of the red pepper butternut squash soup and a blanket on a chilly winter day. Roasted red peppers add a huge amount of flavor to this simple butternut squash soup that you are going to love. By making a large pot of this soup, you can save leftovers in the refrigerator or freezer for another day. Add more or less curry powder to taste, and don’t forget a dollop of cold sour cream when serving. Place the bell peppers skin-side up on a baking sheet and place in the oven for 8 minutes, until skins start to blacken. Remove the peppers from the oven and allow to cool for 10 minutes, then peel off the blackened skin. Add the oil to a large pot over medium heat and add the onion, apples, squash and spices. Cook for 7 minutes, stirring occasionally. Add the bell peppers and broth and bring to a boil. Simmer for 20 minutes uncovered, then cool to room temperature. 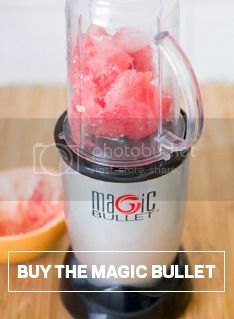 Blend in a Magic Bullet pitcher until smooth and add back to the pot to reheat. Chickpeas are hearty, warm, earthy and healthy, but we rarely see them act as the main flavor or ingredient in their own dish. That all changes now. Thanks to this simple recipe, the chickpea is given center stage in a light soup that’ll warm you on the coldest winter day. Chop half a red onion into small pieces. Add 1 tbsp. olive oil to a soup pot and sauté chopped onion, adding in dry spices while cooking. Add chickpeas and water. Bring to a boil and let simmer for approximately 20 to 30 minutes, until chickpeas are soft. Carefully transfer chickpeas to Magic Bullet, along with some water from the pot, and blend together. The distribution of chickpeas to water is up to your tastes: the more chickpeas and the less water, the thicker the soup and heavier the flavor. Add lemon juice, salt and pepper to taste. Your new way to stay warm this winter! Soups that are versatile are the best because you can enjoy them all year long! This avocado cucumber soup tastes great warm or cold, so you can enjoy it during the cold, winter months, or during the hottest summer nights. Refreshing cucumbers are blended with flavors of garlic, lemon juice and creamy avocado to create a light, healthy soup that you can enjoy as a side or main dish. This soup tastes perfect served plain, but add fun toppings to mix it up. My favorite toppings on this soup include sweet corn kernels and fresh chopped cilantro. If you like your soup on the spicy side, add a dash of red pepper at the end. Add the onion and cook for 7 minutes. Add the garlic, stir, and cook for 2 minutes. Add the lemon juice, cucumber, and chicken broth and bring the soup to a boil. Cover and reduce the heat to a simmer and cook for 10 minutes. Add the avocado and let the soup cool to room temperature. Transfer to your Magic Bullet cup and blend until creamy. Add salt and pepper to taste, and chop with corn and fresh chopped cilantro. If you love peanut butter like I do, you probably spend all your time trying to figure out how to work it into more recipes. For whatever reason, that’s not something that’s done very often, at least not here in the ol’ U. S. of A. But, as it turns out, in West Africa, they use peanut butter to create a delicious and nutritious soup, loaded with lots of vegetables and sweet potatoes for a healthy, savory, creamy, peanut buttery delight. Even better, it all comes together in under an hour using tasty, fresh ingredients, making this a great weeknight dinner that’ll knock your family’s socks off. I’ve adapted this recipe from a giant of Senegalese cooking, Mark Bittman. I’ve also added some extra-savory things to make it even tastier. P.S. This reheats great the next day. Blend peanuts in your Magic Bullet until chopped (don’t make peanut butter) and remove to a bowl. Pour oil into a Dutch oven or pot over medium heat. Add the onion and cook until soft, about five minutes. Blend the garlic and ginger in your Magic Bullet. Add to the pot and cook until fragrant, about a minute. Add chicken and continue cooking for another few minutes, until just coloring. Add the peanuts, chicken broth, water, and sweet potatoes. Bring to a boil over high heat, then turn heat down to medium-low. Stir in tomatoes and kale, then cook, stirring occasionally, until chicken is cooked through, about 10 minutes. Add the peanut butter, soy sauce, and fish sauce, and stir until peanut butter is combined. Taste for salt and adjust thickness by adding more peanut butter or water. Serve, passing hot sauce. Celery root can be a frightening ingredient to cook with, but I recently discovered how delicious it tastes in soup. It has a unique flavor that takes over, providing wonderfully delicate taste and texture. Once you get past the sight of the thing, cooking it is actually easy—and you can even eat it raw, sliced up thinly or grated in a salad. This celery root soup is made with leek, corn, green onion, and tiny egg noodles that are made by blending a few eggs together in the Magic Bullet and pouring them into the boiling soup while stirring with a whisk, similar to Chinese egg soup. The eggs form little “noodles” in the soup when it is boiling and give the soup a great texture. You can thicken the soup even more by pureeing a portion of the soup before adding the egg, and then stirring it back into the pot. Add the leek and garlic and cook for 7 minutes, stirring occasionally. Add the celery root, chicken broth, and pepper and bring to a boil. Simmer for 20 minutes until celery root pieces are soft. Add in the corn. Add the eggs to a Magic Bullet cup and pulse a few times until foamy. While the soup is boiling, add the eggs while stiring in a circular motion with a whisk. Top with green onions when ready to serve. Flädlesuppe in German is translated to pancake soup in English, because the main ingredients in this traditional soup are thin, shredded pancakes! I love this soup because it serves as a quick, easy-to-make lunch with little investment and lots of gain. You can use vegetable or beef broth, depending on your preference. Celery, leek, green onion, parsley and carrots give it a little texture and flavor, but the shredded pancakes are the absolute star in this dish. Here is a tip for shredding the pancakes: cover them and chill in the refrigerator for 30 minutes before cutting them stacked with a sharp knife. They hold together better when cut cold versus hot straight from the pan. Add the flour, salt, sugar, milk, eggs and butter to a Magic Bullet pitcher and blend. Chill in the refrigerator for 30 minutes. Pour 1/4 cup batter on a greased, hot skillet and swirl to thin the batter out around the pan. Flip when edges begin to peel up off the pan. Cover and place the crepes in the refrigerator for 30 minutes. Heat the olive oil in a large pot over medium heat and sauté the leek and celery until soft, about 7 minutes. Add the green onion, carrots, and beef broth and bring to a boil. Remove from heat, stir in the parsley and set aside. Stack the crepes on a cutting board and thinly slice. Serve the soup warm, with a handful of sliced crepes. Whenever I have leftover white button mushrooms, this is my go-to soup recipe! You can downsize the recipe and make even just a small cup of it with a just few leftover mushrooms. There is no heavy cream added to this soup, making it a healthy alternative to most of the creamy mushroom soups out there. With a few simple ingredients that include onion, garlic, and beef broth, this recipe is super easy to make. I like to add a little thyme for a nice, herby flavor. The trick to getting a nice texture is to blend half of the soup in your Magic Bullet, then combine it with the other half of the soup and reheating in the pot. This thickens the soup and creates the perfect texture – not too thick, and not too runny. When prepping your mushrooms, don’t wash them with water or they will get soggy. You can use a paper towel or vegetable brush to clean off any pieces of dirt on them before chopping them for use in your soup. Add the mushrooms, onion and garlic and cook for 10 minutes until the mushrooms are slightly browned. Add the flour and stir. Cook for 5 minutes. Add the beef broth, salt, thyme, pepper and nutmeg and bring to a boil. Add half of the soup to a Magic Bullet cup and blend until smooth. Add back into the pot, stir in the milk and reheat the soup. I love creamy soups, but don’t like the amount of calories they contain thanks to the added heavy cream. That’s why this delicious, creamy cauliflower soup doesn’t contain any heavy cream. What is the secret to its creaminess? A potato! Potatoes are a healthy way to make lusciously creamy soups in the Magic Bullet. I added some half-and-half for taste, but the creamy texture is mainly due to the chopped potato. Cauliflower alone can be a bland vegetable, so I added some garlic and parsley to add flavor. Fresh parsley tastes best, but if you have dried parsley, that’ll still add a nice flavor to your soup. Enjoy this creamy cauliflower soup with a piece of crusty bread for dipping. Melt the butter in a large pot and sauté the onion, garlic and celery for 7 minutes, or until onion is soft. Stir occasionally. Add the chopped cauliflower, potato, chicken broth, and parsley, cover and bring to a boil. Once boiling, lower the heat and simmer for 20 minutes. Transfer the soup to a Magic Bullet pitcher and blend until smooth. Pour back into the pot and stir in the half-and-half, salt and pepper. Serve in bowls and sprinkle fresh chopped parsley on top. Lunch time is probably the hardest meal for a busy mama like myself. Scratch that, so is dinner. And breakfast. Okay, every meal is kind of tough. But lunchtime is unique because during that time, I make my kids something different than I make myself. It’s kind of exciting because it’s a meal just for me, and I can make whatever I want without hearing that 3 out of 5 people in the family don’t like it. Darn picky eaters! But let’s not forget that even though this meal is special, it still has to be quick and painless. When you’re in the middle of making 3 other lunches, wiping noses, kissing boo boos, and breaking up world war 3 over who had Barbie first, lunch must be quick. Also, delicious. That’s a must! Preheat the oven to 400 degrees. On a baking sheet, add the tomatoes, onion, and garlic. Drizzle with the olive oil, and then sprinkle with a little bit of salt and pepper. Toss to coat. Place the pan in the oven and cook for 25 minutes, tossing the vegetables half way through. You can make the kids’ lunches while this bakes. Blend until creamy. You can add a little vegetable broth or milk to thin it out. Season if needed. Serve immediately, or heat up in a pot to eat.